Universal Living Wage :: You can help! how can I advance this cause in my area? There are many ways to promote interest in your community! Once you have fully familiarized yourself with the mechanics of the formula, you will be able to launch a letter-writing campaign with just a handful of people. Not sure what to say to your senators or representative? Here's a sample letter to give you a few ideas. You can use our letter and put in your own representative's name and district, or design your own letter, using some of the suggestions below. Identify your district, county or city. Identify the issue as the Universal Living Wage, for example, " I would like for you to support the idea of the Universal Living Wage." Include the following talking points. The Universal Living Wage formula fixes the federal minimum wage and turns the clock back to a time when a hard-working, 40-hour a week, minimum-wage worker could afford housing. The Universal Living Wage formula uses existing government guidelines. Because the Universal Living Wage formula uses the HUD Fair Markets Rents, wages can routinely be adjusted for inflation. Adopting the Universal Living Wage will efficiently stop the rehashing of a minimum wage. Point out to congressional representatives that one flat/fixed-wage rate won’t help minimum-wage workers in Santa Cruz, CA or Washington DC without hurting small businesses in Harlingen, TX or Macon, GA, etc. It is fairly simple to advance this cause in your area. First, review our list of contact people. If we don't have a group yet in your city or state, you can contact the National Coalition for the Homeless for the name of a representative in your area. Call us at (512) 796-4366. Alternatively, go to www.nationalhomeless.org or call (202) 462-4822. Then, check and see if individuals or organizations are already working on a local living wage issue in your area, city, or state. Present the Universal Living Wage concept. Show people the website. Once you find a lead person or organization, they or you can simply send out a public service announcement tailored to your town. This will bring forward interested people from your area. The main office for the Universal Living Wage Campaign will then provide the names of the responding individuals to the local lead persons or organizations. Direct your campaign to your national congressional leaders, using our talking-point bullets and "design your own letter" bullets. You can also begin face to face delegate meetings with Congressional Leaders. Hopefully there will soon be a legislative bill to support and rally around. It is okay if you haven't identified an organization. Two people can do this. Remember, you are already part of a national movement. If you have not done so already, start holding meetings with others in your area. Invite obstructionists and "naysayers" to leave. They are welcome to initiate their own movement. This campaign is designed for the single purpose of raising standards by indexing the Federal Minimum Wage to the local cost of housing throughout America. This is a volunteer initiative. Thank you. Incorporates the local cost of housing throughout the U.S. Prevents all minimum-wage workers from becoming homeless. Enables one third of the nation’s homeless to work themselves off of America’s streets. Stimulates local construction industries across America. Makes housing available at the low financial end. Share the website address on social media websites like Facebook and Twitter. Thank them for their time and interest and ask them to support the bill and to carry it in the House or Senate respectively. credit card to this cause. 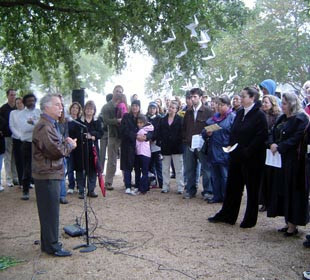 In Austin, Texas we tied the idea to Tax Day and held rallies at the post offices. We also connect the concept to Bridge the Economic Gap Day when we fly banners and yard signs (which we will provide) over major thoroughfares. We will also provide bumper stickers and pens. Using creativity, you can provide newspaper stories, radio skits, etc.